Classes Friday were good, and I got lots of essay-related work done, which is rather necessary at this point. Also rather necessary was some time of relief and relaxation; this was handily filled by a chance to see Plastikman Live 1.5 at the 02 Brixton Academy. Now this might just sound like a night of hedonism, however in fact it was in many ways an experience echoing the ideas we have been discussing in classes and outside about the performer/audience relationship, and the idea that in a mediated world audiences need stimulus or many stimuli to engage. Richie Hawtin, the UK born, Canadian raised, Berlin-based techno pioneer who created Plastikman has always been one to push technology forward. From his early days challenging the limits of analog sound creation, to more recent forays into live performance and digital music creation, Hawtin is known to challenge the conceptions of what a DJ performance is. So when my husband told me of the SYNK app that Hawtin created for Plastikman live shows, I was immediately intrigued. SYNK allows iPhone users in the venue to interact with one another, and with the performer via a live chat, commenting on what is going on and the performance. 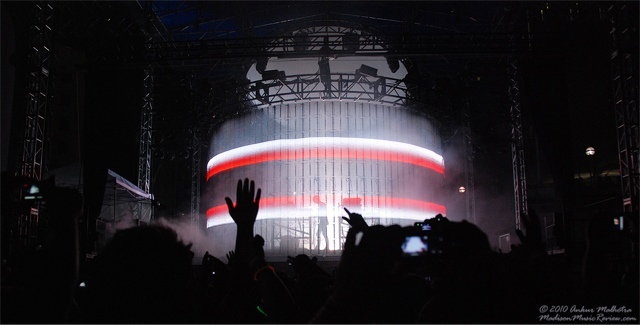 In addition, and more forward-thinking, there are points in the performance where the SYNK users are able to impact the performance, sometimes through the lights on the enormous, semi-circle LED screen surrounding Hawtin in his mad-scientist lab, and sometimes through writing text which Hawtin then converts to sound via his equipment, and samples into the sounds he is creating. It was this in particular that really intrigued me. DJ and producers are notorious control-freaks, obsessed with the sound, the gear, the effect...not unlike many actors and theatre directors. So the idea of opening up parts of the performance to be moulded by the audience, and a large, alcohol-fuelled dance club audience, is at once terrifying, and liberating. Granted not all audience members participated in this, or even knew was happening, but for those who wanted "more", wanted to be part of the action, this additional connection with the performer was offered. The other thing I found uncanny was the "ghosting" going on in this space, echoing nearly 100 years of performance through the very walls. The Brixton Academy was first built in 1929 as a Theatre and Cinema, and physically the space hasn't changed significantly since this time. It still retains the proscenium arch with opera-style columns, and large playing spaces well above, eye-level with the Circle seating. The buildings comprising nearly a full set, including fake trees of what was likely once an attempt at naturalism, still appear surrounding the upper bits of wall. Juxtaposing this history with such forward-thinking dance music experiences as the one we were undergoing; I couldn't help but think of the historical significance of a dance music artist playing in such an historic space. At moments I imagined an opera production, or some Chekovian actors moodily walking about. While dance music is often derided as hedonistic pleasure-seeking, it is moments such as this that remind me of the potential for greatness among dance music artists. Because the truly good ones are just that; artists.